New approaches to electrical power in smart homes can save costs in the face of increasing electricity prices. Paul Cheesman, Business Development Manager Europe North for RECOM Electronic, explores more in this article from ES Design magazine. Maybe smart homes will solve our problems with energy efficiency, but we still have a long way to go. All of our home electronic appliances run on DC – including modern LED lighting – so efficient PSUs will play an essential role in making any significant reduction in power consumption. Even the ecologically-oriented among us have realised that the burgeoning energy revolution has its darker side. Demands for expensively produced solar energy in a pay-on arrangement on the one hand, and prematurely switching off atomic power plants on the other, will keep electricity prices going up. It comes as little surprise that the opportunity to make savings has taken centre stage, with the idea of energy-saving smart home becoming the ideal solution to energy problems. This begs the question of whether the smart home will actually save consumers money in the future, given the heavy investment required to enable heating, lighting, blinds and house services to be controlled by apps on tablet-PCs, or house plants to be watered and pets fed automatically in our absence. Despite any misgivings, the revolution has begun. Many power supply companies have started providing Smart Meter modules that deliver information on usage behaviour. Consumers will start saving once they know how much energy they're using and for what — at least that's the theory. Whether this will still hold true once the novelty has worn off remains to be seen. Take a close look, and you'll see that the smart home of tomorrow has one serious weakness; while incandescent light bulbs, oven hobs and electrical motors are perfectly happy with an AC power supply, every electronic gadget runs on DC — at least internally. All of these appliances, whether TV sets, sound systems, computers or printers draw their power from their own PSUs, each geared towards maximum-load conditions. You could entertain your entire neighbourhood with a 100W sound system, but you normally wouldn't actually do that more than a few times a year; that means that your PSU is practically running idle with horrendously poor efficiency for 360 days a year. Then there are the linearly regulated PSUs on sound systems due to what's mostly a low interference level; PSUs with efficiency that hardly passes the fifty percent mark even at full power. Since a well-equipped household will have a good fifty PSUs or more, energy losses will quickly add up to 100W to 200W. A far more efficient solution would be a central DC mains supply that would power all of your home electronics appliances, including LED lighting, the same easy way you hook your smart phone up to a USB port to charge, but it will be a while before that happens. Even so, it's safe to assume that the rapid switch to LED lighting will speed up the change in attitude. In the meantime, we'll keep on improving with solutions such as efficient mini-PSUs that fit into standard wall outlets, at least doing away with the cable clutter from countless external PSUs. There wasn't much of a market for mini-PSUs just a few years ago, but now a niche market has grown for products running on a few Ws — a development initially spurred on by the EU's EuP (energy-using products) directive that only permits standby and soft-off modes for appliances with 500mW idle consumption from 2013 onwards. This forced manufacturers to start installing mini-PSUs to handle standby electronics in new products, switching the main PSU on and off by relay. PSUs in sound systems used to draw 10W or more in standby, but supplying the standby circuit and controlling the relay requires a nominal power rating of a few Ws in the single-digit range. Many small devices in home and office settings are also far more efficient today; devices such as microcontrollers in the mW range, or sensors or control units rated at 1, 2 or 3W. These are often used in house and office environments in applications such as remote-controlled window blinds or garage doors. The savings principle is always the same — standby circuits have their own mini-PSUs that control relays to cut mains power to the main PSU, which is thoroughly inefficient in standby operation. A manufacturer of voltage converters, RECOM was early to specialise in developing efficient mini-PSUs, and has achieved substantial reductions in idle power consumption in this type of PSU. The smallest PSU, the RAC01 with 1W output, has an idle consumption value of only 30mW — around a sixteenth of the value specified in the EuP directive for standby mode. We often ignore the importance of idle consumption in the energy balance while focussing on a high absolute efficiency value, but PSUs operate far more often at low load than not. Efficiency is measured at full load, which is only one side of the coin — the other is keeping the efficiency level stable and high down to low-load situations. RAC mini-PSUs are especially good at this particular discipline. State-of-the-art smart home solutions are increasingly used in building installations, and this involves lots of electronic components that require an efficient DC power supply instead of the 230V AC mains supply. Devices such as intelligent contact-free switches that react to gestures in setting lighting or heating, door openers with built-in fingerprint readers for recognising people with entry permission, wall outlets with intelligent power monitoring to cut the power once the end appliance has spent a certain period on standby, or mini-pumps to water your house plants when you're away on holiday. These applications run on direct current — ideally not from batteries, but from a PSU integrated into the wall outlet. RECOM has launched a series of regulated mini-PSUs onto the market (the RAC03-SCR/277 series) designed for easy, quick installation into ordinary wall outlets due to their extremely flat, round shape; no need to redecorate after installation. These discs are just 11mm thick, and are easy to install behind switches and dimmers to provide direct current right out of the wall. The flat power discs reach an excellent efficiency value of 78% at 3W power rating, and you can use them anywhere in the world as they work on an input voltage range between 85 and 305V AC, even in the US three-phase mains system that reaches voltages up to 277V AC. 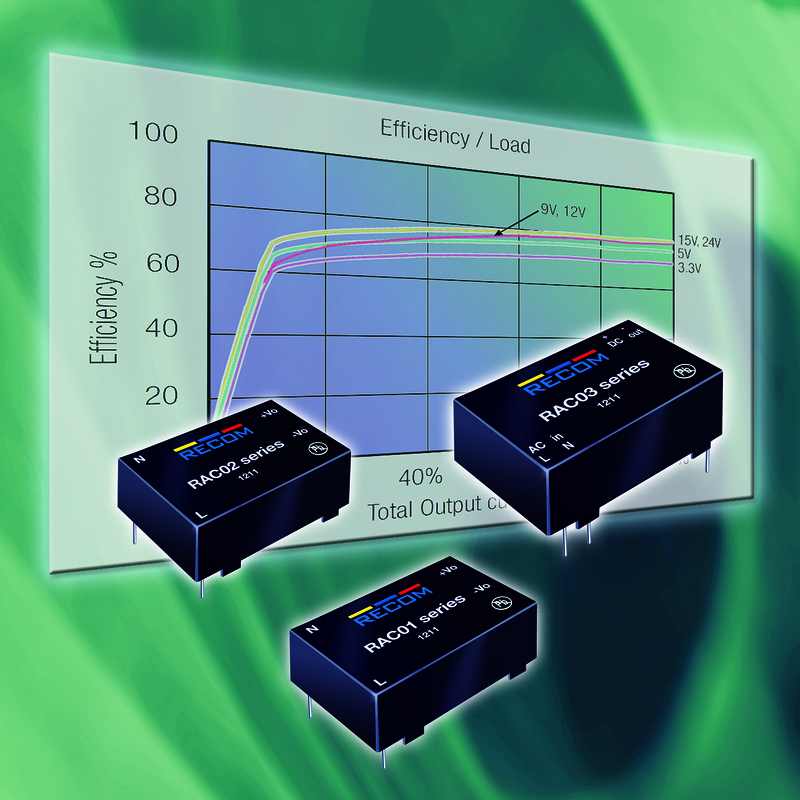 These modules are available in output voltages of 3.3, 5, 12 or 24V with current values of 900, 600, 250 or 125mA corresponding to their 3W power rating. At just 40mW idle consumption, they run at a tenth of the official requirement for standby operation. The RAC03-SCR model is isolated on the output side at 3kV AC, and works at ambient temperatures of up to 85°C. Electromagnetic compatibility plays a key role alongside maximum efficiency in the home environment, as nobody wants even more sources of electromagnetic pollution in their home after the debate on mobile phones. There are two forms of electromagnetic interference; conducted and radiated. PSUs for use in the home are subject to the much more stringent Class B standard in EN 55022/55024 for this reason; Class B sets interference limits at 10dBµV lower than the Class A standard that applies to industrial settings. The RECOM RAC-series mini-PSUs all have a Class B filter integrated into a moulded casing as standard. Filter components such as ferrite cores and chokes can be designed in a more compact form compared to retrofitted external circuitry as any interference is eliminated directly at source, reducing idle consumption and saving costs for filter components and EMC testing. This new series has a host of applications alongside smart home applications, such as building automation or security and communications systems. The new modules have been designed for uncompromisingly long service lives, are CE and UL-certified, short-circuit-proofed, and equipped with spike and surge protection. As a European manufacturer with a global orientation, RECOM always uses high-quality components. Prototypes are subjected to intensive HALT tests in development and use HASS tests to ensure quality during production. Products come with a three-year guarantee. Society has already adopted green energy, the next step will be to start assessing how much energy we need for what. Finding this out and devising use-oriented smart home solutions will pave the way towards real energy savings in smart homes. Can electrical installations cope with smart home demands?